Powerful but easy to learn and easy to use Project Management Software. Uses Critical Path Method (CPM). Tracks schedule, labor, and materials. Uses both Schedule and Cost Work Breakdown Structure (WBS). 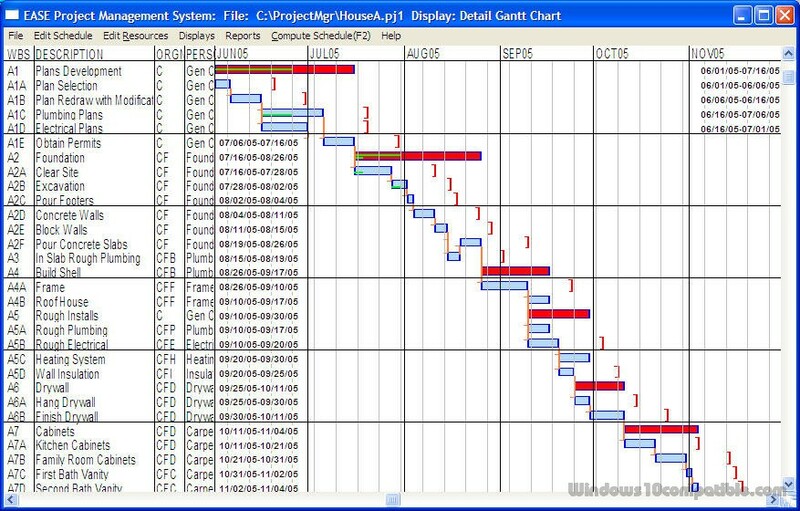 Gantt charts include detail, WBS Summary and varying summary level within a chart. 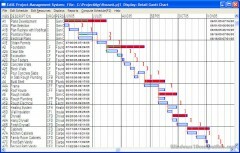 Optional Gantt features include start/end dates, task links, critical end, progress, activity selection and sorting. Color coding of summary versus detail activities. Variable display scaling in all ways. Labor use vs availability histogram, color coded by task. Resource data is used to produce Earned Value reports - Budgeted Cost for Work Scheduled (BCWS), Budgeted Cost for Work Performed (BCWP), and Actual Cost for Work Performed (ACWP). Network diagrams and other schedule and resource reports - all extensively customizable. Task group cloning both from within a project and from other projects. Export and import of data from Excel compatible files. Variety of intuitive data entry dialogs are integrated with the on screen displays. Also includes graphical data editing on a Gantt chart. This software is very intuitive and easy to use. Extensive help file includes a 'Getting Started tutorial. This software benefits from the author's 20 years of experience in Air Force project management and his development of a previous project management system, database applications, and the Graham Business Process Improvement system (see worksimp.com). Free 30 day trial version (200 task). 200 activities on Basic ($49.95) and 2000 on Pro ($99.95) version. Larger task limits are available. Also network versions tracking number of simultaneous users available.